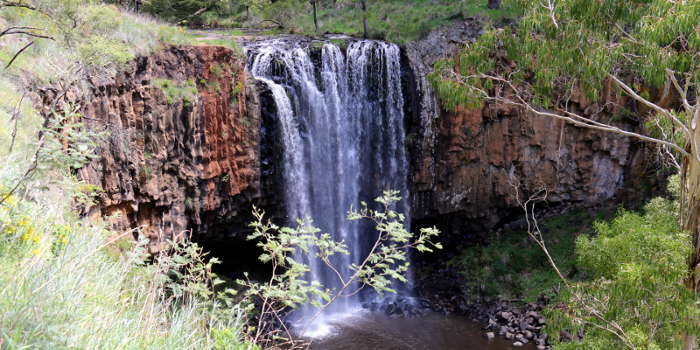 On your drive to Daylesford and Hepburn Springs take the time to visit the beautiful and interesting Trentham Falls. There is an absolute oversupply of natural beauty to explore in this part of Victoria. Millions of years ago active volcanoes shaped the landscape, creating waterfalls and cliffs and laying down basalt rock over gold. Deep underground natural waters flow, collecting minerals and eventually finding their way to the surface in the famous springs at Hepburn Springs Reserve. The same terrain revealed gold to hopeful prospectors in the 1850s and led to the development of major towns in the area. Today visitors no longer come for gold, but for relaxation – drinking and bathing in the the natural spring waters in Hepburn Springs, visiting a day spa, and exploring the natural beauty of the Wombat State Forest. 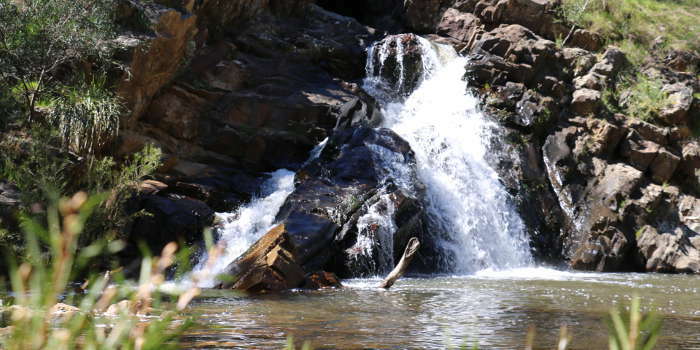 If you love nature and are looking for things to do in the Hepburn Springs area there are some lovely waterfalls and other natural attractions to explore on your own or with the kids in tow. There are some locations that people enjoy visiting no matter their age. Beautiful rivers and waterfalls are one of them. While kids just want to get up close and touch the water, adults can enjoy a picnic, wade in the cool waters and just marvel at the beauty of nature. A short drive via Trentham Scenic Reserve Road will bring you to the cleared car park and picnic area of Trentham Falls. There are clearly signed tracks that take you into the gorge. The Falls were formed about five million years ago. To put that in perspective, it is estimated that humans only arrived in Australia about 40 thousand years ago! An eruption from a volcano sent molten lava flowing into the gorge, where the Coliban river was running. The rock flow stopped at the point where the river flow falls 33 metres over basalt columns and then continues on its 89 kilometre journey. The ‘column’ shapes in the basalt rocks, over which the river runs, were formed as the rock cooled and cracked. 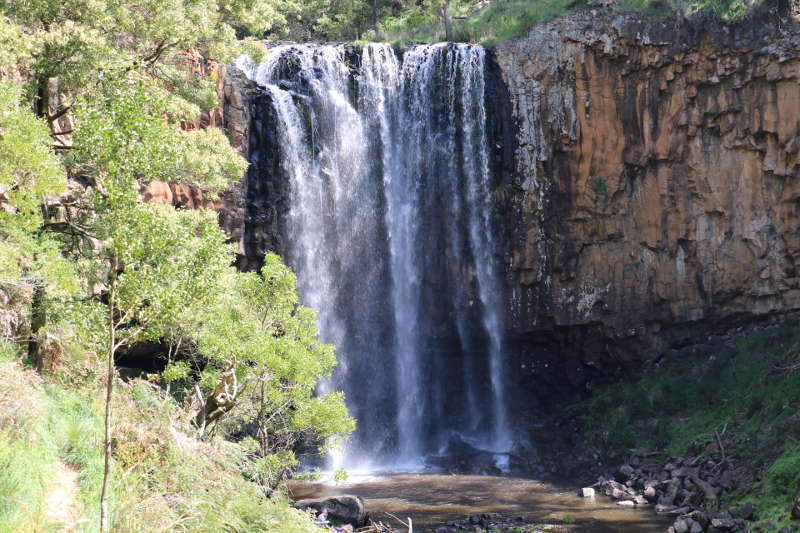 The Falls are the highest single drop waterfall in Victoria. The best time to visit Trentham Falls is after a heavy downpour of rain, but if nature doesn’t provide you with rain, they’re still well worth exploring. If you visit on a quiet day and spend some time, you may be lucky enough to spot a platypus in the waters. The Blowhole consists of a tunnel cut into the side of a hill, through which Sailors Creek runs. In summer, it is often dry, but in the cooler months or after a heavy downpour, the water blows forcefully out of the tunnel and plunges into the pool several metres below. Visitors can see the blowhole from above and also view it from the creek below. You’ll notice the many zen-like stone towers that have been constructed in the river by visitors. Maybe you’ll even want to make your own. The tunnel was constructed in the 1870s to assist miners who were panning for gold. The Blowhole can be accessed via Blowhole Road in Hepburn Springs. Trentham Falls and The Blowhole are just a couple of places to sample some of the natural beauty of the Hepburn Springs area. For those interested in venturing further, there are plenty of walking and mountain biking tracks to explore, including the Dry Diggings Track and the extensive Goldfields Track. If you are staying in Hepburn Springs for a few days, there is a range of accommodation to choose from. 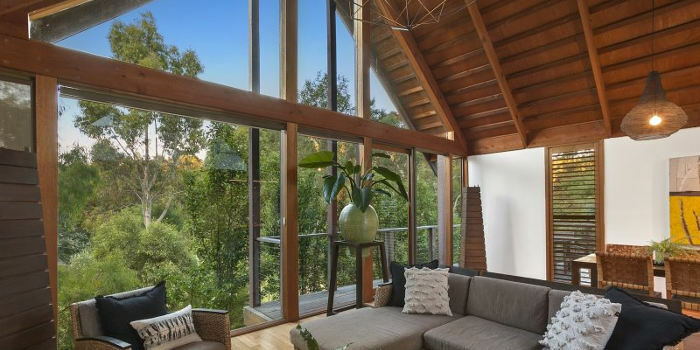 For luxury accommodation in Hepburn Springs, overlooking Hepburn Springs Reserve, the historic Bathhouse, and in walking distance of great restaurants and the pub, Hepburn Spa Pavilions have two luxury spa villas: Horizon and Saffron. Each architect designed villa boasts stunning views and luxury hydro spas for soothing tired muscles. For larger groups or families, Hepburn Spa Pavilions also offers Kookaburra Ridge, a beautiful Italian style country house on two acres of gardens with herb, roses and olive grove.